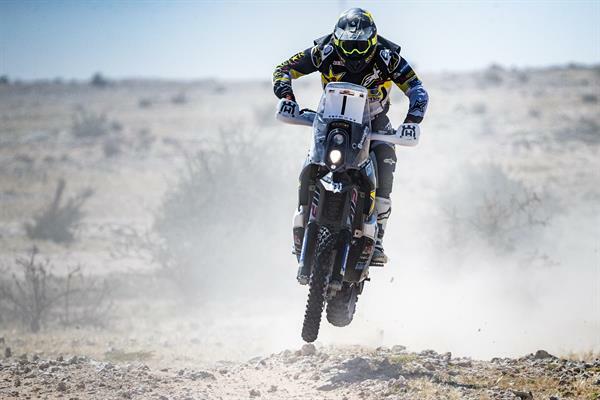 Rockstar Energy Husqvarna Factory Racing´s Pela Renet finished fifth in the penultimate stage of the Qatar Cross Country Rally on Friday, seven minutes behind the stage winner. Factory teammate Pablo Quintanilla crossed the line just 20 seconds behind in sixth place. The Chilean rider opted to save some energy in the final part of the stage in preparation for a final push for a podium on Saturday. The timed special was another 337.76km, much of it at high speed and in difficult windy conditions. Both Husqvarna FR 450 riders averaged a speed of just over 81 kmh. Going into the final stage, Quintanilla is at fifth place in the overall rankings with Renet just under two minutes behind him. Quintanilla admitted he slowed down towards the end of the stage to be in the best physical condition for the last stage on Saturday. Starting at sixth tomorrow he is also relieved of the responsibility of opening the track and is likely to recoup some valuable time. He has also been riding this week with a small knee injury. Meanwhile, French rider Renet, new to this event continues to collect both rally-raid experience and confidence. Renet: “I rode most of the special with (Kevin) Benavides. We rode together and sometimes I was in front and at other times he took the lead. It was a long stage but I am quite happy. The feeling is very good, also for the final stage. Quintanilla starts Saturday 20 minutes behind the current overall leader, who will bear the responsibility of laying down the track, and the early navigation. But he is also only eight minutes off second place, and this will set up a spirited fight for the podium. Riders are to complete the rally on Saturday with another 343km under the clock before they reach the finish line.